Caleb Casey McGuire Affleck-Boldt (born August 12, 1975) is an American actor and director. He is the younger brother of Ben Affleck. He played Morgan O'Mally in Good Will Hunting, Virgil Malloy in the Ocean's Trilogy and Patrick Kenzie in Gone Baby Gone. He portrayed Robert Ford in The Assassination of Jesse James by the Coward Robert Ford which he received an Academy Award nomination for Best Supporting Actor. In 2017, Affleck won the Academy Award for Best Actor for his role in Manchester by the Sea. Affleck was born in Falmouth, Massachusetts. He is the second son of Christine Anne "Chris" (née Boldt), a school district employee and teacher, and Timothy Byers Affleck, a drug counselor, social worker, janitor, auto mechanic, bartender, and former actor with the Theater Company of Boston. Affleck is three years younger than his brother Ben. He has English, Irish, German, Scottish, French, Swiss, Northern Irish (Scotch-Irish), Welsh, and Swedish ancestry. He is a tenth cousin, once removed, of actor Matt Damon, through a common New England ancestor. He was raised in a mostly Episcopalian family. As a child, he had numerous pets, including cats, snakes, guinea pigs and turtles. Affleck went to George Washington University and later transferred to Columbia University in New York City, where he majored in physics, astronomy, and Western philosophy, but never graduated. ↑ "Access Extended: Casey Affleck Talks Oscar Nomination". Access Hollywood. Retrieved 2013-06-22. ↑ Heyes, Rebecca (23 August 2013). "10 Things About... Ben Affleck". Digital Spy. ↑ "Film Interview – Ben Affleck / 'Hollywoodland'". Event Guide. Archived from the original on September 28, 2007. Retrieved 2014-01-09. ↑ "Genealogical Chart Knowlton Line of Ben Affleck and Matt Damon" (PDF). New England Historic Genealogical Society. 2009. Retrieved January 9, 2014. ↑ McGee, Celia (December 18, 2003). "Wild about Jen; Ben Opens Up to our Celia McGee". Daily News. Retrieved January 9, 2014. 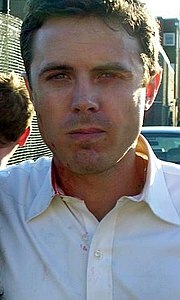 Wikimedia Commons has media related to Casey Affleck.